Stylishly designed with a fantastic display, the Zen nearly matches the iMac's elegance. 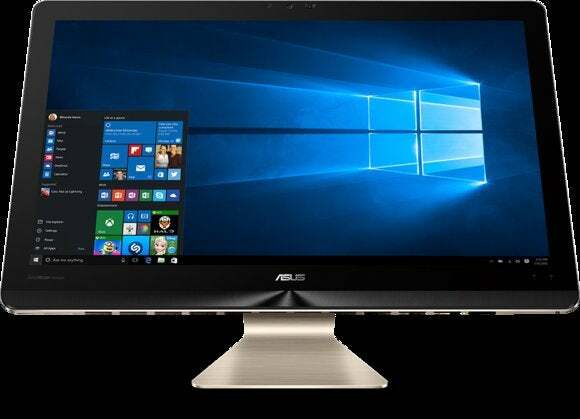 There are times when Asus’s designs rival Apple’s. Indeed, anything with “Zen” in front of it at least attempts the feat, and the company’s Zen AiO Z240IC all-in-one has come close to capturing that iMac-like magic. 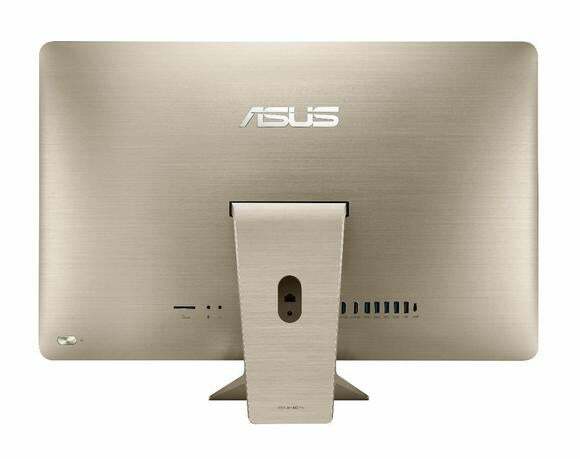 Out of the box, we were impressed with this all-in-one’s attractive design and aluminum chassis. After firing up the Zen AiO we were doubly impressed. Apple would rattle on about “retina,” but in PC-land what you’re talking about is a 3840x2160 UHD resolution display (commonly known as 4K). The high density of the pixels makes everything super smooth-looking, and if you throw a UHD demo file at it… Yowser. If there were HDMI input, I’d say the Z240IC might make sense as a dorm-room entertainment center. As is, it’ll have to settle for close to perfect. 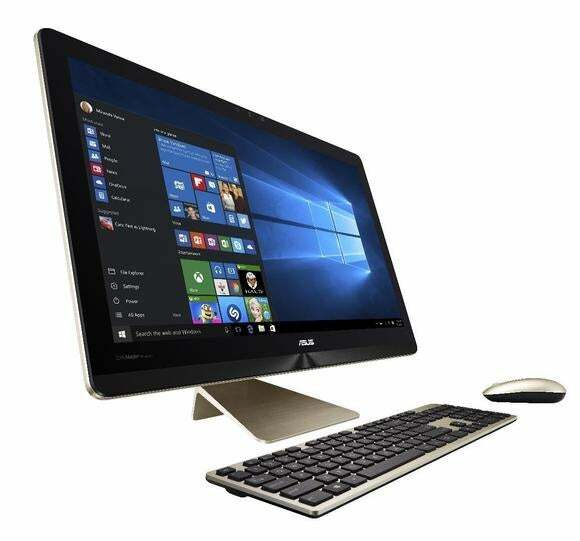 Every component aboard the Zen AiO is near state-of-the-art: a Skylake Core i7-6700T CPU, 16GB of DDR4/2133 system memory, an Nvidia GeForce GTX 960M GPU (as well as the integrated HD 530 graphics), and the cherry on top—a 512GB PCIe-based M.2 Samsung SM951 SSD. That’s good stuff right there. Just in case 512GB isn’t capacious enough to hold all your stuff, there’s also a 1TB hard drive on board. There’s little chance the average buyer will want to upgrade those components. A good thing in an all-in-one, because, without exceptional skills—you can’t. The Zen AiO has state of the art ports, but all of them are on the back. The Zen AiO’s port selection is top-notch as well: four USB 3.0 ports, one USB 2.0 port, and one USB 3.1 type-C port. There are also headset and mic jacks, two HDMI 1.4 outputs, one gigabit ethernet port and an SDHC card reader. My only gripe here is that they’re all on the back, which makes the simple act of inserting a thumb drive a lot harder than it should be. Get a USB 3.0/3.1 dock while you’re shopping. One port I did miss, as I said up front, is HDMI input with HDCP 2.2 support. That puts a damper on my vision of the Z240IC as a future-proof dorm-room entertainment center. Much of the upcoming UHD content will be copy-protected with the latter, and it would be nice to be able to play it on this display. Aside from some initial Intel driver issues (graphics and RealSense) the Zen AiO experience was butter. It posted a 2,930 in PCMark’s Work conventional test and a 3,386 in the Creative conventional test. That basically means it’s far beyond good enough for most desktop chores. 3Dmark scored the 960M at 4,076 in Firestrike (not Extreme or Ultra), 13,262 in Sky Diver, and 17,433 in Cloud Gate--meaning it’s good for moderate gaming loads at moderate resolutions. Tomb Raider benchmarked at 30fps at 2160p and 92fps at 1080p. Bioshock ran at 102fps at 720p, 147fps 1080p, and 46fps at 2160p. For the price, the Zen AiO is an able gamer as long as you’re willing to drop the resolution down to 1080. The Samsung SSD read sequentially at 1,888.4MBps and wrote at 1,511.1MBps with ridiculously low access times. If you’re never seen the stats for a PCIe SSD, those are not misprints. It makes the entire Windows experience pretty much wait-free. Note: Our first unit’s display would black out with no way to reactivate it, and the second unit’s flickered due to immature Intel drivers. If you get an early version of the Zen AiO, update these before you call service. Though they’re colored to match the system, the mouse and keyboard would look even better if they were “brushed” like the chassis. The Zen AiO Z240IC has a ten-point touchscreen and ships with a matching (mostly) wireless keyboard and mouse. I enjoyed the typing feel of the Chiclet-style keyboard, and the mouse was fine, but I do have two slight nits. Both plastic peripherals could use just a bit more solidity-evoking heft. And, though the colors of the keyboard and mouse match the main unit's, they lack its brushed-aluminum texture. That minutiae may not seem worthy of comment, but when you’re competing with a company such as Apple that sweats the details, these things matter. The UHD display has better color than most and there’s no pixelation as with lower resolution displays. The Zen AiO rivals an iMac, but you definitely get more bang for the buck. Where a similarly equipped 21.5-inch iMac costs $2,400 these days, the Z240IC costs $1,899. And the former has no discrete GPU for gaming, has a smaller screen and uses a 5th-gen Broadwell CPU vs. the Zen AiO's 6th-gen Skylake chip. That’s a pretty hefty savings and a big hardware difference. 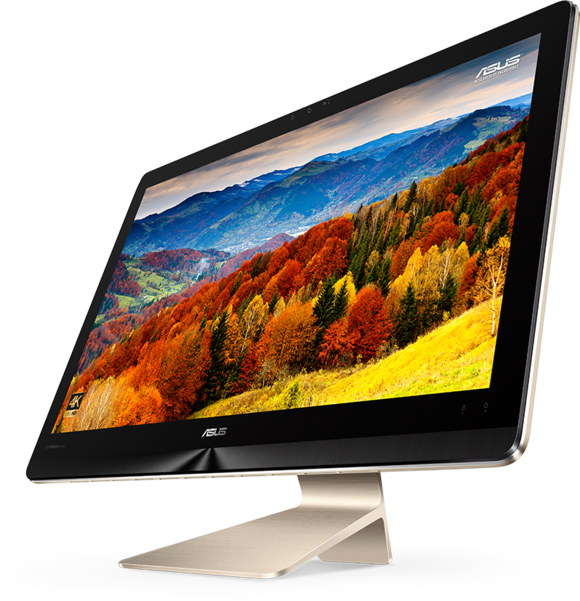 But in my opinion, an iMac delivers a sense of elegance that Asus hasn’t quite captured. Then again, no PC vendor has. I like the Zen AiO Z240IC. I like it a lot. It’s stylish, it has a fantastic display, and it’s fast for both everyday use and gaming. Truly, if my only complaints concern the placement of ports and the paint on the mouse and keyboard, you know it’s a pretty darn good all-in-one.